Polling routing-instances and logical-systems with SNMP v1 or SNMP v2c. This article describes how you can control the scope of polled data by specifying the name of logical-system and/or routing-instance in the community string. It is applicable for SNMP v1 or SNMP v2c. Note: Logical-systems are supported only on High-End SRX Series. The rest is applicable both for High-End SRX and for Branch SRX Series. In other cases, one may want to poll the entire device at once. For example, to retrieve status of all interfaces, regardless of which routing-instance they belong to. You can control the scope by using different syntaxes of the community string. This article explains how. 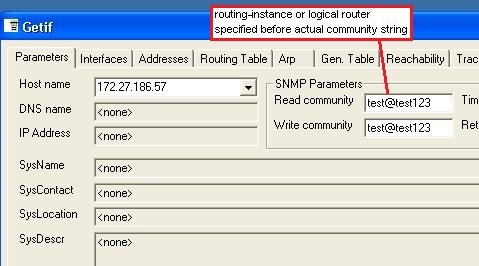 Only if the SNMP request enters the SRX device from the default routing-instance of the root logical-system, the poller can access any scope, according to what is specified in the community string. Otherwise, the poller can access only scopes inside his logical-system (it can still choose the routing-instance it is interested in). Here lsys_name stands for the name of the logical-system and vr_name stands for the name of the routing-instance. a default routing-instance has a name “default” (e.g. lsys1/default@public or default@public). The most staight forward syntax includes only the community itself (e.g. public), both lsys_name and vr_name are omitted. As we will see further, in most cases (but not always!) it is similar to the form default@public (which means default routing-instance in root logical-system). Finally, we will demonstrate the results of polling 4 different objects with different scopes. One user-defined logical-system (LSYS), called “lab-lsys”. One user-defined RI under the LSYS “lab-lsys”, called “qa-vr”. Assume that we configured community string is “public” and set system location to “Main Office”. Security-related objects, like jnxJsPolicyTable, return values that are relevant to the specified logical-system. Note: based on common deployment scenario, the ifTable object returns the full list of interfaces when polled with the simple community syntax (“public”). This addresses the common need to monitor all existing interfaces using one community string (by adding the SRX device to the monitoring solution only once).